Beautifully tooled resin with a black base color predominantly highlighted with fuschia tooled designing, the side of box is also garnished with tooling and designs with hearts, and a lotus flower. 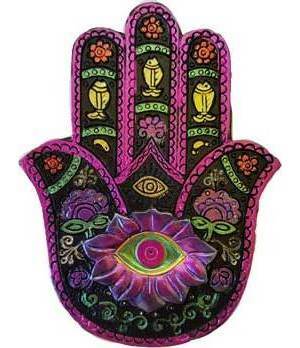 This Hamsa Hand box is perfect for small trinkets, treasures, or keepsakes. Measures 5' long x 3 1/2 from tip to tip width, inside box depth measure 1"..